Out of sight, out of mind but certainly not overlooked. 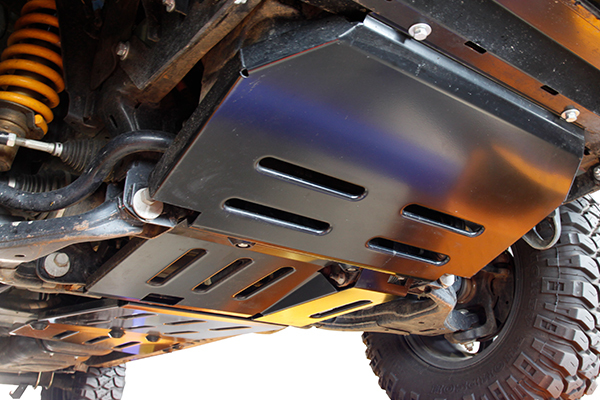 To protect the most vulnerable components underneath the vehicle TJM Under Body guards are constructed from 3mm thick steel sheet and incorporates strategic folds for incredible strength. They are electro-coated black for corrosion resistance of up to 500 hours. The advantages of electro coating is that it gets into all the nooks and crannies and is much more resilient to chipping when knocked around, unlike powder-coated varieties. • Provides excellent underbody protection. • Electro-coated black for up to 500 hours of corrosion resistance. • Press folded in strategic areas for absolute maximum strength. • Front underbody, sump and transmission guards available. • Drain access holes for sump and transmission where necessary.